On the hunt for a new BMX Frame? Have you given the Matt Roe signature Conjuerer frame from Mutiny Bikes a look yet? This frame is made from 100% 4130 Sanko chromoly tubing with a 74.5-degree head tube angle, 69-degree seat tube angle, 11.6″ bottom bracket height, 8.1″ standover height and an 13.25″ (slammed) chain stay length. The Conjurer frame features a gusset on the down tube, an integrated seat post clamp, a wishbone on the chain stay, a wide back end to fit 2.40″ tires, and 14mm drop outs with a Mutiny Bikes logo stamped on the caps. The Conjurer frame comes in top tube lengths of 20.2″, 20.8″ and 21.2″ with color options of dark red and raw and a weight of 4.9 lbs. (20.8″). 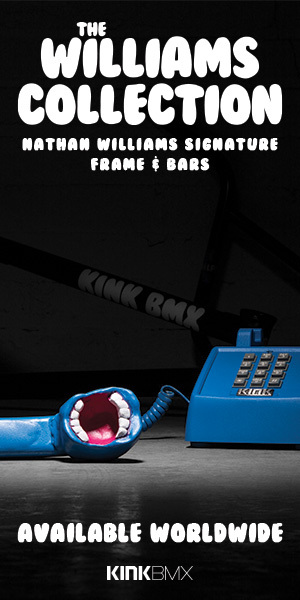 This frame is available through BMX shops and mail-orders that carry Mutiny Bikes worldwide now. Mutiny Bikes logo stamped on the end caps of the stays. Integrated head tube with a gusset on the down tube. Wishbone on the chain stay for increased strength. The Conjurer comes in raw and dark red.